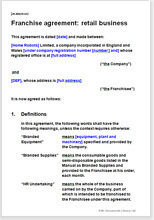 This franchise agreement is for a business that sells goods. A franchise arrangement would be used instead of a standard sales agreement if the franchisor wishes to retain a level of control over intellectual property (particularly brand), the sales experience or the sales of after sales service. This is an extremely comprehensive template, suitable for a wide range of businesses,which can be crafted for your specific needs. Manufacturers do not usually create franchises of retailers for their products. Usually it suits both sides for aretailer to take full charge of how the products are sold. However, if the sales service is important to the product brand then a franchise agreement such as this one could be used. Where the manufacturer needs to retain control over aspects of the retail operation (such as having access to customer information). The agreementcovers an enormous number of issues important to franchising. We believe it is comprehensive enough to be used by the largest franchise chains. For smaller businesses, it should be an ideal basis from which to craft an agreement that not only protects the rights of the franchisor, but also impresses prospective franchisees. We would expect this agreement to be used by a solicitor or other franchise advisor. However, because the key to drawing a good franchise agreement relies on knowing the nuts and bolts of how the business works (rather than knowing complicated law), a business owner could also use it with ease. Use of plain English makes every sentence clear. Should you be buying an agreement from an on-line retailer? The advice from the largest association of franchisors in New Zealand, the Franchise Association of New Zealand (the FANZ), is that you shouldn’t use an advisor who isn’t a paid subscriber to their association. That advice extends to franchise agreements bought from online retailers. This isn’t impartial advice. The trade association is comprised of experienced and knowledgeable people, but it is a private company, commercially operated to promote and to protect the financial interests of its subscribers. There is no additional qualification required to practice franchise law, just as there isn’t to being able to draw a lease. Commercial experience is the important quality to seek. When it comes to selecting a franchise agreement from an online retailer, we suggest that you look at templates from several different suppliers in order to evaluate which one is most comprehensive and suits you best. Templates are not expensive compared to the cost of a solicitor's time, and the benefit to your business of getting your franchise agreement right is enormous. Bear in mind that a short agreement,regardless of where it is bought, is unlikely to protect your business sufficiently,not because the law relating to franchising is overwhelmingly complex, but rather because the practical considerations of how the franchise will work require more than a few pages to record them. The Franchise Association of New Zealand promotes ethical franchising. We agree with this, not as a matter of philosophy but because a successful franchisor is one who helps his franchisees to create profitable businesses while he expands his own. Your franchise agreement has to form the basis of a sound and profitable deal for both sides. There are no specific laws or regulation for franchising. Your franchise agreement is governed by common law. That gives you great freedom in structuring the arrangement in the best way for you and your franchisees. You can set the rules as you like. However, your prospective franchisees and their advisors will look carefully at your proposed agreement. That means that the agreement becomes very important in recording the rights and obligations of the franchisor and the franchisee. It should reflect accurately and in detail the terms agreed. The more comprehensive the franchise agreement is, the less likely there are to be misunderstandings and disputes later on. The end customers are businesses or consumers. This is a common model for many high street retailers, whether or not the franchisor is a sole manufacturer of all the stock, or is just a distributor. Examples include French patisserie chains to sports clothing shops. This agreement could be used where the goods will be sold in a concession. The concession could be run by a franchisee independent to the rest of the shop (such as in a department store) or by the owner of the shop as a separate business unit (allowing the owner to be a specialist stockist for the franchisor while offering the products of other companies as well). Where the product requires additional service to bring it into use or maintain it, and the franchisor is unable to provide this service himself. An example of a business that requires the product to be customised is specialist sports equipment (such as ski boots), where it would be impractical for the customer to visit the manufacturer to be fitted. An example of a business that requires the product to be serviced would be a home cleaning robot retailer, where the product is unusual and sophisticated and requires maintenance by a specialist. The agreement is comprehensive enough to be used by a business of any size, but we assume that the business will be small or medium sized, perhaps with several established branches already. The franchisor may be new to franchising, or may be looking to extend into New Zealand. The franchise territory can be of any size, from part of a town to a continent. Generally, it is more advantageous to the franchisor to keep the area small and grant licenses to operate in additional areas to the same franchisee later. This agreement can be used to grant territory outside New Zealand. The agreement does not cover ownership and lease of property (premises) by the franchisor. The agreement assumes that the franchisee will own or let the premises outside of this agreement either from the franchisor or someone else if required.